Above: Ruidoso is becoming a premier mountain-biking destination, thanks to the new Grindstone Lake Trail system and the 12 Hours in the Wild West race, being held there this month; it was previously staged at nearby Fort Stanton. IF YOUR NEW YEAR’S RESOLUTIONS have been flagging, remember this: The inertia that can set in during March and April will result in having to forgo your white skinny jeans come Memorial Day weekend. 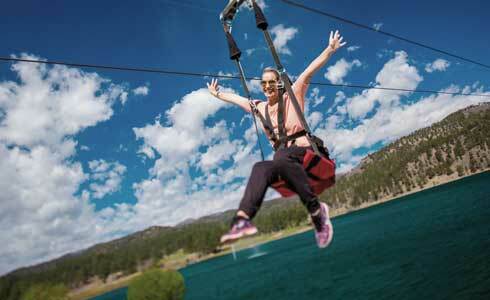 Stay on track and have fun doing it in Ruidoso, where you can enjoy Boulder-quality recreation without making the drive and spending the ducats. Regional athletes, from Texan swim and track teams to former light middleweight champion boxer Austin Trout of Las Cruces, seek out the benefits of training at Ruidoso’s 7,000 feet. 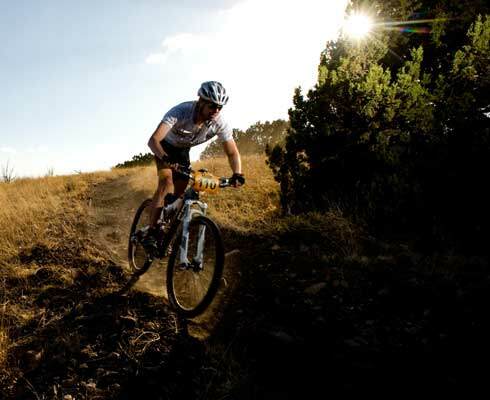 And whether you’re a core mountain biker or a weekend trail walker, you’ll find your own Ruidoso rhythm: exercising in gorgeous alpine surroundings, refueling with delicious meals, and soothing your muscles with “what’s-my-name-again?”–good spa services. 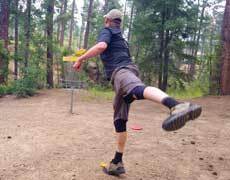 Robin McLean sinks a putt at last year’s state championships at Grindstone Disc Golf Course. Whether you’re a novice or pro at winging Frisbee-like discs into metal chain targets in the great outdoors, Grindstone Disc Golf Course is “as challenging as it is beautiful,” says Marcos Castillo, NM’s Professional Disc Golf Association Coordinator. This 27-hole course requires a variety of different shots, as it’s very hilly and there are a lot of trees and a creek bed. The course hosts the state championship each August, drawing players from all over the country. Castillo deems it the best city-owned course in the state, comparable to ski-mountain courses in northern NM. Dates will be announced closer to August; check elitebrothersdiscgolf.com for details. Ziplining over the lake at Inn of the Mountain Gods. COURTESY INN OF THE MOUNTAIN GODS. 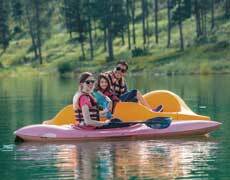 Rent kayaks and paddleboats at the lnn of the Mountain Gods. When Joe and Avril Coakley bought the Ruidoso Athletic Club in 2004, it had suffered through 20 years of neglect. The historic WPA building, built in 1941, was originally the town’s schoolhouse. Then it became a community center, a church, a senior center, and then a down-at-heel gym. The Coakleys renovated, refurbished, put in a sound system, and stocked the rooms with state-of-the-art equipment. Shiva Reinhardt, the owner and yoga instructor at Blue Lotus Healing Arts Center. 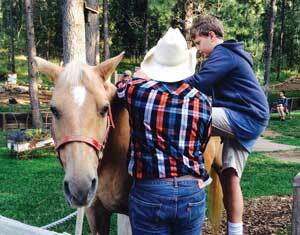 Guided horse-back and pony rides are just part of the fun at Flying J Ranch. —Candace Walsh also wrote “The Art of Living,” about Hurd–La Rinconada Gallery and Guest Homes, in nearby San Patricio.